Dan Bradley's Red Dawn does a fine job distancing itself from the original, but while doing so becomes a mostly mindless action picture with a rather shallow message. Dan Bradley’s Red Dawn was one of two shelved films sitting under layer of dust over at MGM after financial reasons caused the company to eventually sell off the properties in hopes of collecting some sort of cash. 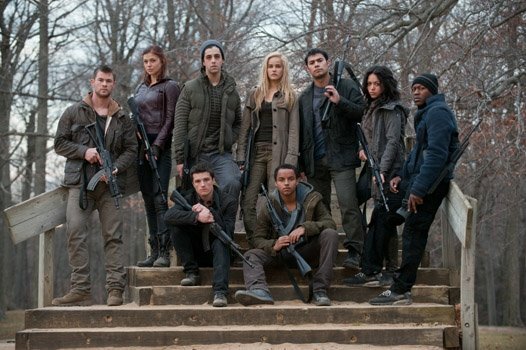 Fortunately for us the Red Dawn remake took advantage of the now-popular cast, causing the film’s release to be a mediocre event that works because of its well-staged action sequences and occasional shining moments between cast members. Jed (Chris Hemsworth) and Matt (Josh Peck) are two brothers cut from very different cloths. Jed’s got a military background and is home on rest trying to bond with his father and younger brother Matt, while Matt simply wants nothing to do with Jed after their mother passed and he was left all alone to face the pain. Matt’s instead focused on school, his girlfriend, football and things that most young kids are tied into, but that all changes once a war is brought to American soil without warning. Now, the two brothers must form a group with other young kids (Isabel Lucas, Adrianne Palicki and Josh Hutcherson) to fight back and take back their land before the foreign invaders cripple the entire country. Dan Bradley’s remake of the 1984 “classic” is definitely a modern telling of a familiar tale. What Bradley does is take the basic skeleton of the original film and expand upon it, making for a film that I’d almost argue is better. I’ve never been a huge fan of the original Red Dawn, but the remake worked for me as a mostly harmless action picture. Sure, it’s also mindless and shallow, but the performances alone boost it up above most crap getting recycled by studios. Chris Hemsworth and Josh Peck make for believable brothers. Hemsworth has the whole military tough guy role down to a science, while Peck fades in and out as the emotional brother just looking to rebuild his family. The two carry the film, while Josh Hutcherson and Isabel Lucas do nothing more than add a little variety to the character dynamics. What cripples the film is Dan Bradley’s failure to keep a stronger focus on the overall picture. The action in the film is well-staged and fluid, due to Bradley’s extensive background work as a stunt coordinator, but the film gets weighed down by lengthy and pointless stretches of dialogue almost every ten or twenty minutes. It almost feels like whenever a character dies or gets hurt Bradley feels the need to reinforce the importance of teamwork. Teamwork is indeed important, but hearing characters talk about the same thing over and over is a bit redundant, especially when Hemsworth and Peck seem to the be the only ones comfortable with delivering the thicker material. Not once does Bradley suggest that Red Dawn is anything more than a quick PG-13 action film, with humor seasoned in to keep it from turning stale, so why the need to constantly force the film’s cheesy patriotic messages? Do the filmmakers really think anyone watching the film gives a damn? I know I certainly didn’t. Not once does the film extend past its silly plot and because of that it shouldn’t be taken seriously. Playing by those standards makes Red Dawn a film that’s not too hard to swallow, but at the same time one that you’d probably be fine never even watching. There’s a handful of decent explosions, and some good performances out of a few of the cast members, but aside from those tiny compliments Red Dawn is something that would have been fine staying on the shelf indefinitely. I’m glad that it got released, but at the same time I’m still confused as to why they even bothered making it. Red Dawn comes to Blu-Ray with a clean 1080p video transfer that looks great, but feels plain. The film uses mostly woodland colors, like dark yellows, greens and browns, causing the presentation to rarely wow, but remain faithful and consistent. Fox is known for quality and this is another quality transfer, with a little grain to help define the image and make for a hearty, yet bland picture. The 5.1 DTS-HD Master Audio track highlights the various action sequences that are truly the best moments of the film. Bradley certainly knows how to shoot action and luckily for us it was mixed with the same care and attention. Planes buzz by on the back channels as bullets and explosions follow. Dialogue is spread out on the front channels, making for an always-on and constantly active experience. For some reason Fox decided to not include a single bonus feature, aside from a DVD copy and UltraViolet Digital Copy. Red Dawn isn’t too worried about making a lasting impression. I’d pick it over the original, but at the same time I wouldn’t downright suggest it to anyone craving a solid action film. It gets the job done, but barely. The cast is held together by two performances that stick out and work more than the rest, while the direction remains safe and predictable, aside from the occasional action sequence. The Blu-Ray is what you’d expect from Fox on a technical level, but the lack of a single bonus feature makes this one a rental at best.